Hungary is a country located in Central Europe and member of the European Union as well as the Schengen Area. After World War I Hungary lost 71% of its territory, 58% of its population and 32% of ethnic Hungarians. Today Hungary is an upper-middle income country with a very high Human Development Index, which looks at life expectancy, education and the standard of living. According to data from the acclaimed CIA Factbook, Hungary has about 6.17 million Internet users, who account for 62% of the total population. A study by Gemius shows that one in four online Hungarians is between the ages of 25 and 34 and about 86% of the online audience uses the Internet on a daily basis. Data from Eurostat shows that 20% of Hungarians (aged 16 to 74) have bought something over the Internet in the last three months. Research from eNET shows that one in five Hungarian Internet users has a tablet. while another study from the same company suggest the number of people buying goods online reached 3.4 million in 2014. This equals 72% of regular adult Internet users. 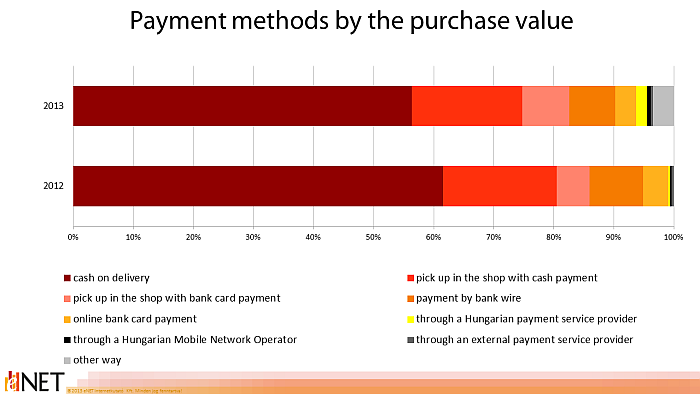 This last study also shares some insights into the preferred payment methods in Hungary. It seems that Hungarian online consumers prefer to pay upon receiving the goods (58%) or to pay using a bank transfer (45%). When it comes to choosing a delivery method, it shows that most people (72%) want their goods being delivered at home, via a courier service. The study also claims 82% of the respondents say that shipping costs are the main consideration when choosing a delivery or pickup method. Half of all online buyers consider the delivery time as important when deciding on the delivery method, while easy access to the pickup point is deemed the least important. In 2017, cash on delivery was still the most popular payment method in Hungary. Based on data from a study conducted by eNET, the total ecommerce volume in Hungary reached about 1.65 billion euros (545 billion Hungarian forints) in 2017. Just as in previous years, the online retail trade volume of Hungary increased considerably. Research from the same company in 2016 showed that the ecommerce industry in Hungary reached 1.02 billion euros in 2015 and that it accounts for 4.1 percent of the overall retail industry. The most popular product categories in the Hungarian ecommerce are computers and electronics, home equipment, toys and presents, and clothing. Ecommerce in Hungary accounted for 3.1 percent of total retail sales in 2013 and for 6.2 percent in 2017. Some of the most popular and biggest online stores in Hungary are Tesco, Media Markt, eMAG, Vatera.hu and Ujjé.hu. November 28, 2018The Palletways Group, an express palletized freight network that distribute to 20 countries across Europe, has further expanded its network. Together with independent transport providers, Palletways will launch a new network in Hungary. June 29, 2018For the first time, the ecommerce turnover of Hungary has surpassed the psychological limit of 500 billion Hungarian forints. Ecommerce in Hungary was worth 545 billion forints, or 1.65 billion euros, last year. June 30, 2017Ecommerce in Hungary was worth 427 billion Hungarian forints, or 1.38 billion euros in 2016. The online retail industry in this Eastern European country now accounts for over 5 percent of total domestic retail sales. In Hungary, more people are shopping online while the average basket value also increases. September 22, 2016DHL Parcel Europe has expanded its cross-border ecommerce network through a new partnership with Slovenia and Hungary. The parcel company is now working together with the Slovenian Pošta Slovenije and the Hungarian Magyar Posta to strengthen the cross-border ecommerce market and to expand it range of services. Read all our articles about ecommerce in Hungary.